I am feeling very emotional today. Defeated. I thought it would be therapeutic for me to get it all out. Because I know that feelings like this must be acknowledged... in order to move on. Ben hates being woken up to take his medication through the night. He's always been a sound sleeper, the one that really really loves his sleep. So interruptions at the hospital - much less at home - really irritate him. "Daaaaad, you keep waking me up," he complains. "And that makes me really tired during the day, too." He's really annoyed by it. Every moms knows that being woken up at any point through the night equals a more restless sleep. The same goes for Ben. But the idea of NOT waking him up to give his steroids is too frightening. So we continue to wake him up. Every five and a half hours. To be sure the dreaded headaches don't return. This afternoon, the boys had their kindergarten testing. Except Benjamin was too tired and just wanted to stay home and rest. It was completely fine; the elementary school was sort of expecting it and had promised to make other arrangements if this week wasn't convenient for us. So I just took Jack instead. It felt so emotional, walking into my alma-mater holding only one boy's hand. When I had always thought about this experience holding two. I just wasn't ready for it. I felt so sick I wanted to throw up. And then tonight after bath time, Andy took the boys downstairs for Movie Night - a once-a-week treat that has since become a nightly ritual - and I stayed upstairs to pick up the wet towels. I heard Andy calling for Ben to join them, but then I heard my little one say, "I'll be there in a minute. I just have to wait for Mom." I looked up from the floor and saw Ben, walking toward me from the top of the stairs. I almost lost it. Ben always waits for me. Ever since they were little, Jack has always seemed to gravitate toward Andy. Ben, me. If we are walking into a restaurant, Andy would try and hustle inside with the boys while I get Megan and the diaper bag. Jack was always happy to walk in with Daddy, but I'd always expect Ben to come running back to hold my hand. Tonight I had an overwhelming flood of emotion. Oh, how I would miss my Benjamin! God could perform a miracle. He is able. Oh, how I wish He would. I think I'll be crying myself to sleep again tonight, like I did so many nights after we first learned of Ben's diagnosis. Praying. Hoping. Wishing. Begging God for that miracle. I am praying with you for a miracle, and asking every mom I know to do the same. My heart is just breaking every time I read your blog. Ben is in our Amazing God's hands who loves him so. I also am praying for a miracle. May God continue to watch over you and your family as you journey down this most difficult road. Peace and Love! I am with you praying for a miracle because I no He can cure Ben if it is in his plan. Oh my heart is in pain for all you are going through right now. My husband also has brain cancer and I feel these feelings in a very similar way. I just wish Heavenly Father could step in and keep these special people here on earth with us forever. I am praying so hard for your family. What a special little guy you have. Thanks for sharing, it's a privilege to pray for you and an honor to cry with you. Do you realize we are crying WITH YOU? Waking at night, feeling the tug on our heartstrings and knowing in that moment it's time to pray again. Thanks for the reminder Ben to WAIT, we won't step one foot more in this journey without relying on God...not one step! Oh Mindy, we are literally weeping and begging right along with you... I don't know what else to say, but I will pray for peace. No one can begin to imagine your pain and anguish. You are doing all you can. We will all keep storming the gates of Heaven for mercy to allow Ben to stay here with you. Let God's angels give you some much needed sweet rest tonight. You need to be at your best for you and your precious family. I pray for you and your family. My 6 children as well are praying that a miracle will happen for Benjamin and your family. I do not know you, yet I cannot stop thinking about you and your family every single day. I am praying for sweet Ben and the entire family. May God wrap His loving arms around you at this time and always. My heart breaks for you. I'm praying hard for a miracle for your precious Ben. Praying SO hard. And also praying for peace in your beautiful mothers heart, as I can feel the incredible love you have for your son. Please Lord, hear our prayer. Isaiah 41:10 So do not fear, for I am with you; for I am your God. I will strengthen you, and help you; I will uphold you with my righteous right hand. Praying for Benjamin from Texas. God is able!!! YES HE IS!!! We are all praying with you! Crying with you, praying for you. We are praying and praying and crying for you and with you. I think about you all day and pray for you and Ben every time I do. Praying for rest for you tonight. Mindy, I'm hoping to meet you on Sunday at the benefit. I too have a Benjamin that's 4.5 years old. I have asked for prayers from everyone I know...your family is on our prayer list at church. Please know you're in my heart and I pray for a miracle so many times throughout my day-to-day tasks. Oh Mindy, my heart is breaking for you. As a mom, one momma to another, I just would urge you to keep a journal...write down those cherished little things that Ben does that make you smile, make you laugh, those little things he says or does that brighten your day. These are the memories you'll cherish whether God gives Ben a miracle or if He calls Ben home to be with Him. Please know that you and your family are in my prayers. I have been following Bens story, Mindy. My heart breaks for you, for Ben, for you all. I woke in the night last night, numerous times. Each time I prayed. I too am weeping and sobbing with you. Tonight at 8:30, I BEGGED God. With every single tear, I begged. Praying for you ALL. Praying for a miracle for your precious boy. Lord Jesus, I know you hear our prayers on behalf of Ben and his family. My heart hurts for this family but I rest in the knowledge that you hold Ben in the palm of your hand and that you know the outcome and that it will bring honor and glory to Jesus. Lord please comfort Mindy wrap your loving arms around her give her peace that only you can give. We will continue to pray for a miracle but also wish for what is best for Ben who was created by you for your glory. I thank you for being Jehovah Jireh- the Lord will provide. AMEN!!! Not only am I praying for you, everywhere I go, everyone is praying for you and your family. May you feel the arms of Christ embracing you as so many lift you up in prayer. God bless you MIndy...however God chooses, Ben will always be with you. As a mother of 3 myself, my heart aches with you, my tears are falling, and my prayers are lifted to the heavens for Ben- for his siblings- for family and friends. Your journey has made an impact on many. Personally it made me pause to enjoy the little things. Thank you for sharing. I wanted to let you know that I've submitted a request for prayer through the Christian Prayer Center and we have thousands of people praying for a Miracle for your sweet Benjamin. May God provide you with the strength to get through this journey and for Ben, no pain and complete healing. Please let us see Your Miracle Heavenly Father. In Jesus Name, Amen. We are praying for you to know the strength and security of being in His hand as you go through this ordeal. Even though we don't know you, your little family is in our prayers. I thought about you and your family today while at work- continuing to send good thoughts and prayers your way. you are all so blessed to have one another!! loving thoughts and prayers sent to you!! Please ask ALL doctors to try CYBERKNIFE. It is a noninvasive laser treatment for tumors. It is very successful. Please ask doctors ASAP. It can save your sons life. I am praying for all of you. God and his angels are with you. Like so many others have said, I do not personally know you, but ever since I read your posts through fb sharing, I have been continually thinking of and praying for Ben and all of you. As I read this latest post, I am in tears with you. Know that I am fervently praying tonight that God heal Ben, that each and every cell in that tumor is destroyed by our Great Physician. And before my children went to bed this evening, I reminded them to pray for Ben in their personal prayers. Lord please heal Ben this side of heaven! As the mom of identical twin boys who are now 6 and who had their own very big battles in the beginning, I am weeping and suffering with you. Your strength leaves me at a loss for words. I know that our Heavenly Father is wrapping His arms tight around you and your precious Ben. I am praying constantly for a miracle...that God would allow Ben to grow up to be a shining light and an example of God's glory and love. "For I know the plans I have for you, declares the Lord, plans to prosper you and not to harm you, plans to give you hope and a future". My dear friends are walking through a very similar storm with their precious 8-month old baby. They too love Jesus with all of their hearts and our clinging to His truth for their strength to make it through. It hurts me so much to know that you and your family have to walk through this too! I will be praying for Ben and for all of you too. Jesus, we believe you for miracles and we declare LIFE over Ben in your name! Here is a link to a CYBERKNIFE center in New York. God bless. We here in Maryland are praying fervently for Ben and for all of you. It grieves our hearts more than you can imagine that your little fellow has such an aggressive brain tumor. We wake in the night and pray and pray often during the daylight hours. We wish there were more ways to emotionally support your beautiful family. I have not had the privilege of meeting you or knowing your family, but I work with so many teenagers who have had you as a teacher and who all have been praying for you and have asked me to do the same... and I am. We are all praying for a miracle and praying that you can experience peace - that Mary will be with you and your family, just as she was there with Christ her son at the cross... May God bless you, your husband and all three of your children; today and always. As a fellow twin mama.....I continue to storm heaven's gates with prayer. Every day and every quiet moment.May you feel His continued presence. My boys and I prayed for you tonight and we will continue! Please know that You,Ben and your whole family are in my daily thoughts and prayers. I wish you could feel the warm hug of love being sent your way!!! You are not alone! May God bless and keep Ben, and all your family. I wish I could help. Praying for you all. I can't even read your blog without tears coming down my face. I feel your pain so much and yet know you're even feeling it so much worse. Your sweet Ben and your family have been in my prayers and will continue to be. I've followed the blogs of very sick kids for years now, watching some be buried and some be healed. I fully, 100% believe Ben will be healed. To God be the glory. I heard your story on WDCX and cried all the way home on Tuesday. I have a four year old son and cant imagine what I will do if something happen to him. I am so encourage by your faith. We are serving a big God and He do not give us more than we can bear. He is still the same yesterday, today and will be forever. You have a mighty army fighting this battle with you. If God is for us who can be against us. You know I love video tapes of special occassions. Of birthdays, xmas, easter, vacations, all those times that we want to be able to look back on and remember how joyful we were. In the world before February, I'm sure you took many of those pictures, videos and tucked them away to pull out one rainy day. Maybe now is that rainy day to look at all the fun things that the family has done. Time to laugh and remember and maybe, record you watching and reminiscing together. Listening to your boys remembering times together and hearing their comments about each other, and stories that this will prompt them to tell... well, it's all wonderful healing energy for all of you. I love the fact that you are doing the regular things like shopping and the toy store, and I thank God for the moments you're having where Ben is not in pain so he can participate in this journey. As long as he is able, tell him all the stories you would have told him as a young man. The dreams you have for him and his brother and sister from when they were each born. I find my grandchildren love to hear about themselves and what we did as parents and grandparents when the were born. Don't leave any words unsaid. And listen, listen to what Ben wants to say too. God loves all of you, and His greatest gift to Ben may be to shorten his suffering. Only WE are the ones who have to stay here....but it's only temporary. Ben's sense of time will be that of our Heavenly father's. You can honestly tell him that you will see him very soon. Heaven doesn't operate on a 24-hr day... so soon, will be soon. Those words comfort both of you. God always operates in HIS time, not ours. I have seen it this past week for myself and chided myself for allowing worry to creep into my life. It never added one minute to the time. And God kept His promise to me. Praise you my Lord and Savior and Keep Ben from any pain or suffering. Amen. Mindy my heart aches for you. I have been praying for God to give precious Ben a miracle. God Bless you and your family. My family and friends and I are praying..SO many people around the world are praying for you and Ben and your whole family. I've been sharing your story through my fb page and blog. The Body of Christ is rising up on your behalf, pleading for a miracle. God *does* give us more than we can bear..then we fall on Him, trust in Him just like you are doing. May He carry you through this. I pray you find comfort and resolve Mindy. Seek the Lord and his comfort through this. My son is in remision from Lymphoma ( much different) than brain cancer but the fear is the same. We are all praying for you, Ben and your family. Stay strong and with Christ. Mindy, the more honest you are, the more effectively we can pray for you. I have had Sarah ''wait'' for me in the same way - when I got to that part of your blog I burst into tears and couldn't read further - had to walk away for a while. But of course I forced myself to come back and feel the pain right with you. I want to not only thank you for being so transparent, but encourage you that many of us are continuing to join you in the ''watches of the night,'' and now we know better how to pray. You are not alone. My dear friend, the darkness will not last forever. '' He will help you right early.'' But until then, know that at that very hour when sleep evades you and peace refuses to come, the Lord is tapping on the hearts of many of us near and far, to support you through the storm. We love you, Dear! to a mother in pain? to make it go away? as she cries out in pain? to ease this deep pain? loving arms around these in pain. You pour out Your healing. We know there's just God. We know God is good. We know that He can. We wish that He would. We lift up our hands. We give praise to our King. We lift up our friends. We use our voices to sing. We will praise Him forever! We will praise Him for always! We will love Him forever! We will love Him in all ways! ~ by Cindy Bazzel ~ bought with a price and praying for your dear family in this difficult pain. Dear Sweet Mindy, I completely understand your need to fall apart. The important thing is that you put yourself back together! You can't allow this defeatist attitude to hold you down. There is little time for that. I hope you read the email that I sent and TRULY RECEIVE the info about God's powerful medicines. I encourage you to pray heavily about YLEO and then I encourage you to walk forward in your answer from God and your instincts. You and your family are in my heart and I will pray continuously for God to make His presence known in your home (which it sounds like He is doing a pretty good job already). I will gladly stand in the gap between you and God when you feel your faith waning. In His High and Holy Name I Pray! Amen! Jesus is our Healer!!! Please read every verse on healing in the wonderful Word of God, it will increase your faith and give you peace. Jesus healed ALL who came to Him in faith, and what an awesome testimony you will have when your precious darling Ben is healed by the Mighty Hand of God when drs could do nothing....it will bring Him such glory. I am standing firm in the Word of God, knowing that He will be with you all, that He will grant you all the peace that passes understanding, the peace that only He can give, and knowing that He loves Ben more than we can even fathom and He will be with Ben through all of this, doing what is very best for him. Jesus loves you, He loves Ben! Stand in His promises, and on His Word!! I'm praying for you and your family, God bless you all. Your son is absolutely beautiful! Mindy, I have a great amount of Empathy for Ben. When I was 9 years old I was struck by an Aluminum Easton baseball bat by a boy warming up to go up to bat. This event caused my skull to crack on the left side and bruise my brain. In addition a fragment of bone was lodged into a vital academic region. I'm pretty sure I died that day, it was a miracle I was brought back to consciousness. After this incident I wasn't permitted to sleep but only a short nap here and there for a few weeks for the fear that was had that I would loose consciousness and not wake up. I pray that the Lord sends healing for your son, I pray that your Ben is able to get full rest even if its half the time desired, that he be energized by the Holy Spirit to return to a normal childhood free of infirmities, for a Supernatural Healing to take place. May the the Lord comfort you. I pray for you and your family to have increased strength and faith that Grace fall upon you all through this time. Goodness!!! I never thought i would understand a stranger i dont know this deeply!!! In church we were challenged to believe God. I thought about Ben, you, me and my own and I am pouring my heart out believing that can heal Ben! Mindy thank you for sharing. We are just another family you do not know except we are brothers and sisters in Christ. I just wanted you to know, and hopefully feel, the prayers surrounding your family, especially little Ben. May God grant your heart desires and give you His peace. I have no words.....but be assured that your son and your whole family have continuous prayer being lifted to our Heavenly Father. I am so sorry for all that your family is going through. I think of Ben all the time and pray constantly that God will give your family the miracle you deserve. In constant prayer for Ben, you, and your whole family. Reminding myself constantly who God is -- He is way bigger than our afflictions. Reminding myself to be expectant that we will receive what we have prayed for. With you in prayer and in hope, relying fully on Him and trusting in His power and most of all His love. Crying for you and with you. Tears are streaming down my face too. Many are crying and praying for a miracle with you. This is so emotional and I understand you so much. My family has been through so much the passed years, you won't believe it...cancer is just incredible, changes all and everything. It breaks my heart to read about this very aggressive form appearing in your sweet little boy. How can this be? I marvel you for your faith in a God; if there is a God how on Earth can he place such a thing in a young properous child? Unfortunately I know what you will be going through in the near future; I experienced that not praying will help, but strict medication and lots of love! Only to support research for a final cure will help, so many are affected, it just breaks me....Thinking of you and your family I wish you the best of luck and strength! Our family has not stopped praying for a miracle. We cannot stop crying and thinking of sweet Ben. You have a wonderful family. You do not walk alone. I woke up in the middle of the night and my thoughts immediately went to Ben. We are all thinking of you, praying for you and for Ben and your entire family. You are so strong, such a great mom! Ben is beautiful, so handsome. Thinking and praying . Claiming 2 Kings 20:4 for you today, sweet mama. "I have heard your prayer and seen your tears; I will heal you"
I continue to pray along with all Ben's prayer warriors. I also have a hard time settling in at bedtime. I pray for Ben, but I also pray for Mindy, Andy, Jack and your entire family. God Bless you all. Praying so hard for a MIRACLE. God is Great. And he is very aware of Ben's struggle. God save this precious child. Hang on to the promise you ARE (Ben and the whole family!) are in HIS GRIP!!!! Your Father is Heaven is looking down on you, his daughter, and is so proud of your faith. He knew ahead of time he could trust you with this trial. Because of your faith his glory will be shown either way, but my prayer is that He would completely heal Ben and in doing so show his Glory through this healing. I’ve gone through a trial similar to yours. I was on a plane trying to get to my daughter who had been in a car accident, not knowing if she would be alive when the plane landed. I knew in my heart and soul that if the Lord decided to take her home she would be in the loving arms of Jesus who loved her more than we even could and I made the decision and told the Lord that I would love him and worship him whatever his decision was. But for my sake and the sake of our family I prayed he would let her stay with us longer. My prayer is the same for you and I won’t stop begging the Lord on your behalf to heal your precious son. God is keeping track of all of your tears, He is collecting them in a bottle, He is recording each one in his book. He sees you and loves you and although you don’t know why this is happening, you worship and know the ONE who does know. May your comfort rest in that truth. Please Lord, our great Physician, perform a miracle and completely heal Ben. My heart breaks for you. His eye is on the sparrow and I know he watches you, and little Ben and the family. He knows the plans He has for you, plans of good and not of evil. I pray God's peace engulfs you and the family. It is well! Tears and more tears. This is painful but let go and let God because He has the final say. In the name of Jesus. Mindy, thank you for sharing your heart with us. Having just experienced a medical crisis with my 5 month old son, my heart hurts for you, your family, and most of all, your Ben. Trusting in our Lord JEHOVAH. "Thou wilt keep him in perfect peace, whose mind is stayed on thee: because he trusteth in thee. Trust ye in the Lord for ever: for in the Lord JEHOVAH is everlasting strength"
Praying for the Lord's comfort and healing for Ben and strength for you and your family. Thank you for sharing. Dear Mindy, i came to know of your situation yesterday from the updates Mcgreevy cakes put up. I am praying for you all and Ben. As a mum i can't even begin to imagine what you are going through especially reading your post today, i just could not fight the tears. i pray that God will continue to be your strength that Ben will receive a miracle that would perfect His healing. Stay strong and continue to trust God even if right now it may be a challenge. You are a wonderful woman and God bless you and strengthen you. The hardest thing is to let go of the things we love, His grace and peace is what i pray for you right now in Jesus name. Before I lay my head down every night I pray for a miracle for your sweet little Ben and your family. I hope you read this. I don't know you, but I wish I did. I was wondering if there was any way to contact you personally. I cried when I found out about little Benjamin. I've been praying for you constantly during the day, and when I wake up at night. I have asked the Lord to give you strength and, if it is his will, to save Ben. For Him to show us what a miracle looks like. I hope the Lord will give us the opportunity to meet Ben one day here on earth, to see his sweet smile and his loving face. I have never wished for something so strongly, never prayed so fiercely. Remember that you are part of God's plan, a plan to prosper you not to harm you, to give you a future and a hope (Jeremiah 29:11). You are not alone. We are praying for you, and God is with you and will be with you always. Weeping, being heartbroken, and praying right along with you, even though I do not know you (learned of you through a childhood cancer group I follow). It breaks my heart that anyone should have to go through this, and I cannot even imagine how it must feel as the ones living through it. I wish there was something I could do to help. You are showing tremendous courage, strength and grace, as it seems, is Ben. Thinking of you all and sending love and strength your way all day every day. I just learned of your beautiful families story today. I am praying for Ben as if he is my own son. I have personally seen God perform miracles when no one thought they were possible. I pray today that God gives your entire a sense of peace that only He can give. I pray that God lay his hands on Ben. I pray for the doctors to make wise decisions. I pray that everything you see today will reflect God's fingerprints...showing you just how much he loves each and every one of us. Ben, My continued thoughts and prayers are with you and your family. God Bless. I woke up in the middle of the night thinking about you and your family...about Ben and God and the healing, the miracle that He is more than capable of. Then I thought about something I recently read about...it keeps popping up- something I'd never even heard of a month ago and I feel compelled to share. At the risk of sounding a little crazy- I've just heard so much about cannibas curing cancer. I hope this is not offensive, I just couldn't get it out of my head when thinking about Ben and your sweet family. Here is one article that may be informative: http://www.collective-evolution.com/2013/08/23/20-medical-studies-that-prove-cannabis-can-cure-cancer/ I am continuing to pray pray pray for that miracle! May the God of Hope, Healing, Mercy and Peace be with you all this day! I am inspired by your boundless faith. I have been praying for Ben since I saw your story. My heart and prayers are with you. I came across a scripture passage today through a sermon by pastor Steven Furtick. The passage is 2 Kings 4:8-37 The Shunammite's Son Restored To Life. I immediately thought of you. Our God is so faithful!!! I will continue to lift Ben and your entire family up in prayer. I have made your blog my home page. Every time Ben's sweet face pops up I pray "please heal Ben." Please let his family learn of something new that can help him. Please give him more time. Something. Anything for this sweet boy. Your story has been on my mind and heart since I heard it. I am praying so hard for him and your family. Every single day I start my prayers with Ben's name right on top. Your family has been on my heart and will continue to be. We have never met, though we both attended Houghton and have several mutual friends. I learned of your story through one of them a few weeks ago and have been praying ever since. I have shared your sorry with my Facebook friends, cancer group, dog group, and most everyone I've talked to. I'm praying from up in Canada, and I know of people sending love and prayers to you from South Africa, Australia, and beyond. You said the other day that this is the perfect set up for God to work a miracle ... and you're right. Especially with people all over the world praying and crying out to Him on your behalf. I will continue to pray, and wait on God for a miracle for Ben. Oh my heart feels your pain as I read this. Oh I will be praying and believing in a miracle. I pray blessings of peace and healing your way. AMEN! There are no words to express the sadness I feel in my heart for you and your family. Be strong, and hold on tight to the hand of your baby boy, for you are his hero, and if you believe the way mothers do, he is yours. He is most certainly mine. Sending you a hug today and at least two for tomorrow. I will continue to pray for Ben's miracle. Your family is in all of our thoughts and prayers. God will perform when you trust him bkindly without any doubts or second thought.... I am really sorry for Ben... I am sure God will do his best for Ben. God bless you all. Take care. I can't imagine what you're going through Mindy. I am praying for Ben and for your family. I know so many would want to shut themselves inside and deal with this alone. I am so humbled to have the privilege of praying for you and walking with you through this in some very small way. Thank you for opening yourself up to the Christian community to embrace you and your family. We are wearing blue for little Ben today at work. As a mother and Christian sister, I am praying for that miracle and for God to keep breathing His promises into your heart and life. With tears and prayers - you are in my heart. Reading your blog just breaks my heart. I wish there was more I could do for you other than pray. I believe that God can do amazing things and I believe Ben could get his miracle. I will continue to pray for a miracle for him. I'm going to light candles today in my church for your family and especially for Ben. From one stranger to another, I send you my love to you during such a hard time. Stay strong and keep your faith! I am sure you have sought out second opinions, but I used to deal with a physician at Strong in Rochester- Dr. Michel Berg, a neurologist. He was doing some work looking at different ways to reduce the size of brain tumors to make them treatable or operable. Maybe he can offer you some new ideas. Dear Lord, look upon Ben with the eyes of Your mercy, may Your healing hand rest upon him, may Your life-giving powers flow into every cell of his body and into the depths of his soul, cleansing, purifying, restoring him to wholeness and strength for service in Your Kingdom. May the entire Sauer family rest in Your abiding presence. Relax their every tension, release them from their anxiety, so that they may receive more and more of Your healing life into their hearts and into every part of their being. Amen. I pray that the doctors are wrong. I work in a hospital and i heard doctors tell patients that they will not make it, but I see them survive. It's not Ben's time yet. He is creating such a beautiful miracle. Hundreds of people are reconnecting with God through him. I don't think Ben's mission here on earth is done yet. He will be healed. I strongly believe in positive energy. Let's all think positive that he will be healed. Let's not give up on Ben. I will pray and pray for his miracle. God bless! Like many of your readers, I don't know you. I just want you to know I'm praying for your family. God is good, His ways are perfect, and He has equipped you and your family for this very STEEP climb. Keep the faith, you are inspiring so many. Think of the people you are encouraging. Think of a soul saved because you were willing to be used as one of God's holy vessels. Think of the good that is already being done. Thank you for inspiring all of us to be found worthy of His calling. Praying for Ben and whatever capacity he has to understand all of this that he not be fearful, that he continues to live out his four-year-old heart's desires, movie night, bathtime, that he just finds joy in the very simple things. Ultimately, though, I am praying for a miracle. Mindy, Shelley Brautigam is our daughter. Because of her postings there are many of our friends, and their friends praying for Ben here in GA. We are praying for a miracle, and weeping with you as you walk through this time of suffering. I continue to petition God on your behalf! Please know that although we do not know you - our prayer networks are praying for you all - and for Ben's healing. Lord, hear our prayers! Sending love, and prayers from Manitoba, Canada. I have been reading and praying for your family and your sweet son ever since my cousin first posted about him on her facebook. However, I am going through my own personal tragedy today, and am feeling very fully broken and have been questioning how I can keep pushing on. And then I just read this post. And that Psalm at the bottom. And it felt like God placed that there for me. So, although I know that does not in any way ease your pain, know that in some small way, your faith helped ease the pain and strengthen the faith of someone else. Sending prayers and thankfulness from Atlanta, Georgia. My heart just breaks for all of you. Since I heard of Ben's condition, I cannot help but cry myself. How can this little boy be so strong and keep fighting everyday? Ben is loved by so many people whether they know him or not. His smile just melts your heart and he is always so happy. Ben needs a miracle and prayers, but most of all he needs Gods love to pull him through this. I am terribly sorry for you all. Dear Sauer family. I just want to say that your faith and love for your Savior is a huge testimony. We are praying for Ben and for you all! We have a daughter who has had many medial issues and we have been in and out of the hospital many times. She is now 20 and was dx with lymphoma a year ago. She lives in Ny and we are in Maryland, as at 18 she wanted to try life on her own and is determined. It breaks our heart to watch her struggle and not know what the future holds. We know where eternity is, but not knowing day to day what will happen. She spends as much time in the hospital as out, but when she is out, she is determined to live life. As a mom it is very difficult for us to not be able to feel like we are helping her anymore. I have definitely had to learn how to let go and let GOd more so than ever as I watch from a distance. We go up to NY especially if she wants us there and once in a while she comes down, but otherwise it is phone calls, of which or hard when she is calling from the hospital. Your testimony and faith has encouraged both my husband and myself to tears. You are right that these are Gods children and He loves them more than we do and our glimpse into life is but a small piece of his giant puzzle and plan. I just want to thank you for your tremendous parenting, and gentle spirit and huge faith. We are praying healing , grace and blessings over you and your family. Your testimony and faith will change lives , as it has greatly affected mine. My heart is breaking for you. As a fellow twin Momma (and one of mine is also Benjamin), I can completely understand how hard it must have been to go to that school. Future plans and dreams are always pictured with two. :( I am so sorry and I have kept you, Ben,and your entire family in my constant prayers. PLEASE GOD, GIVE THIS LITTLE BOY A MIRACLE!!! Love and prayers from Frisco, Texas. It is good to listen to the doctors but God is sovereign. I have stage IV cancer and tend to go by the statistics. At my last scan God said to me "Expect the unexpected" Expect a miracle!! The Most Blessed Mother knows your suffering like no other. She will intercede with Jesus for Ben's healing with a heart of compassion. 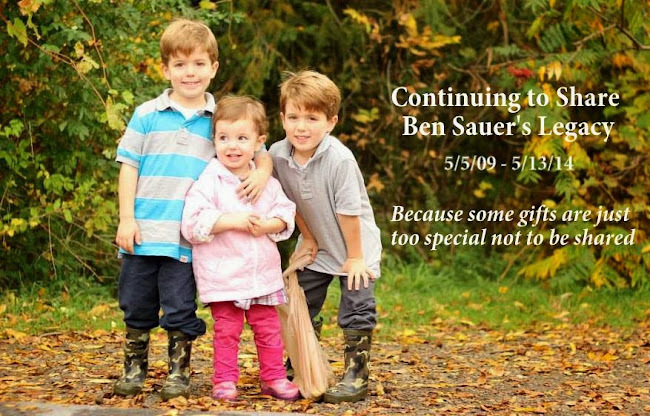 As a mom and dad of 3 boys ourselves; 2 on this side of Heaven and 1 on the other....we think and pray for Ben, you, your husband, Ben's siblings, family, friends, doctors, etc. constantly. I am waiting for that miracle post. We will continue to pray for you all. I know that God does have a plan and that hope is real. I didn't always know that 10 years ago...but I learned fast and have not let it go since. Prayers of strength, love, HOPE and of that Miracle for Ben! Here I sit .....my body is aging....I don't take care of it the way I should. A chils is hurting and a family is suffering and my aches and pains seem so minor. This story has touched me so deeply.This child has just started in life and I pray the Lord hears all the prayers being said in his behalf. May the Lord wrap his arms around each and everyone in this family and heal this child. Comfort the family as tears roll down my eyes Lord please hear the prayers ......in Jesus Christ name...amen. Praying for Ben, You and the entire family. I will start to pray for Ben and your family, and add it for the woman prayer team at my church. I also have a 4 years old son. I am praying for that miracle, for Ben, and for you and your entire family! As a sister in the Lord I send you my love and hugs... you are right, God IS able, and loving, and hears our prayers! God lovingly teaches us to cling to our Redeemer... my heart hurts for you.. but each time I am tempted to worry about my own problems I will be praying for Ben! albeit just a smidgen of broken heartedness for you and your family, I weep too and find myself waking up at night also praying for a miracle for your boy. And he will enter heaven and wait for you,should God so choose. Dearest, cry; your own flesh and blood is hurting so why would you not. I pray God gives comfort because that prayer I know will be answered. My heart breaks for you even though I know you not. I would hold you close and wipe your tears without saying a word. Please know that is what I am doing in my heart for you tonight. Praying down heaven's blessings for your family. And let their fretting cease. Crying and begging with you. Lord, we know that You are the God of healing. Please work a miracle in little Ben. May the headaches stop and the tumors disappear. In Jesus's almighty Name, Amen! The fundraiser was just incredible! The City of buffalo and beyond... all of Western New York ~ truly the city of good neighbors! Thousands of people all there for Ben and the entire Sauer family. If you know just one member of their extended family, you would know why soooo many people show up in their time of need. Great people! Sending everyone prayers, good thoughts and lots of love! Praying for your precious boy. Our family just went through the same disease this past Christmas. I wish nobody had to live through this...so sorry. I wish I had words of comfort and hope - I wish I had answers - Only God has those. I do feel HE has impressed upon my heart to share with you something I had done. Take Ben to an orthodontist and have them make an impression of his hand...I know you will cherish it as I have with all of my children. I am praying and fasting for all of you. You have such a beautiful and heavy heart! I live in Clarence and nanny for a family with 3 boys! The twins are 3 (almost 4!) and their brother is 9. My heart breaks hearing this story, so close to home, so close to my heart. I think of the babies! The twins! While they aren't my own, they feel like it! One, named Benjamin, shares the same qualities as your son! They are so joyful and happy and playful boys! I couldn't imagine my life without those handsome little smiles! Your Ben is so strong and he is a fighter! He is your fighter! You are so strong and your courage and strength are SO inspirational, keep it up for Ben!! We (Along with our Heavenly Father!) love and support you! I am so sorry, all of you will be in my prayers. I believe God is still our God of miracles. It is when things are the most hopeless then we can say it has to be God and give glory only to Him. So even though things seem impossible now as we know with God all things are possible. There are no words. Please know that we are praying in Arkansas for a miracle for your family. There are soooo many of us praying for a huge miracle for sweet little Ben. I also pray for you and your whole family for the strength to get through this horrible time. Please God: heal this little guy and make him healthy again! Praying so hard for your little Ben. You don't know me but a friend linked to this on her facebook profile. I too am a mum to three little ones and my heart absolutely breaks for you. I'm praying for healing, for strength and for confidence in the unshakeable love of our Father. Truly praying for you and your sweet boy!! I can’t imagine the pain you are going through and your little man, your sidekick, oh poor baby! God is good and He will answer all your prayers! I will keep you and your family in my prayers! My heart aches for you and your family as I read this. My older brother had a brain tumor, Medulablastoma, when he was 5. While I don't remember a lot of that time, I do remember some things, like how much I wished my brother could play with me. I remember when I first realized that he would never be able to run and jump with me again because of the surgery and chemo. And it was hard. It still is hard. He survived and his life is a constant encouragement and joy. His story is a blessing and has touched many people. Never give up hope and never stop telling his story, there is always someone who can be encouraged by it. Praying for Ben, for you, your family and the people around you. My heart breaks for you. I almost lost my son at 3. Miracles do happen, someone was looking over me and my wonderful son. He had a rare birth defect in his pulmonary system, it was found with little time to spare. Surgery was performed immediately, I was told after to expect him to have several severe handicaps if he recovered from the surgery at all. He is now a 21 year old young man who is an Engineering student at UB. He was never supposed to be able to read. Please.. pray for a miracle.. pray to Father Baker, never lose hope. We are proof, miracles do happen.. may God bless you and your family. You are in our prayers. All your troubled thoughts away. In the precious arms of prayer. Ben is an active four-year-old who loves playing in the backyard finding snakes, frogs and worms. He builds forts, plays with sticks and likes to shoot his brother with dart guns. As a twin, we always dressed Ben in blue so others could tell him apart from his identical twin brother Jack. And now, Ben is waiting on a miracle. Jack is older by only a minute, but definitely the firstborn. Ben is laid-back and self-sacrificing. Both boys enjoy excessive time in the sun, tumbling in the dirt and wrestling with their daddy. Blessings. Jack and Ben were born on our second wedding anniversary in May 2009. Megan joined our family in April 2012 and now we are expecting another little girl in September 2014. I had been a sixth-grade teacher before the boys were born and have since been very grateful to be home with them full-time. God has been very good to us.